FILE - A screen shot shows Chinese Patriotic Blogger Zhou Xiaoping's Sina Weibo account, in Beijing, China, Oct. 23, 2014. China’s proposal that would require companies to register Internet domain names domestically is raising concerns about tightening of Internet rules. China’s recently proposed new regulations that require companies to register Internet domain names domestically is raising concern about a further tightening of access in cyberspace in a country that already has some of the world’s strictest online controls. Analysts said it is also feeding worries about the impact the rules could have on business and competition. Domain names provide Internet users with a simple way of linking up to websites. Behind each name is a numerical IP (Internet Protocol) address that connects users to a server where information and data for the website is stored. For security and service reasons, many domain names for websites in China are registered overseas. But that is something authorities are looking to change. China’s Ministry of Industry and Information Technology, or MIIT, published in March the draft rules for public comment and immediately sparked a backlash, with some wondering if the regulations could lead to the complete blockage of websites with domain names abroad. The deadline for public comment ends April 25 and it is unclear how soon the rules could be approved after that. The body also said the rules would not affect the ability of users to access those websites and that the rules would not impact the efforts of foreign companies to launch services in China. Assurances aside, there are still questions about the possible impact of the new regulations. And for now, it appears that local Internet companies will bear the brunt of that burden. For starters, if the new rules are approved, they will add to an already heavy load of administrative work that local Internet firms bear, said Charlie Smith (pseudonym), co-founder of GreatFirewall.org, a website that monitors China’s online censorship. In an emailed response to questions about the proposed rules, Smith said authorities should be concerned the new rules could spur local companies to speak out about the overbearing costs of doing business in China. FILE - In this photo taken Feb. 2, 2015, a woman browses her smartphone near other attendees at a press conference in Beijing. 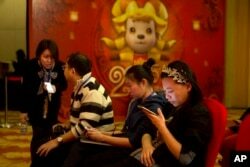 China announced in 2015 that users of blogs and chat rooms will be required to register their names with operators. Although the rules aim to promote local data storage and real-name registration for websites, something that could benefit local companies, the requirement to register domestically will bring extra costs for Internet firms, such as marketing and maintenance. “Right now it seems that the key target of the regulations are companies that use domestic servers but have their domain name registered overseas,” said Matt Ma, an intellectual property rights lawyer. In addition to companies, the new regulations are also likely to have a huge impact on personal websites, blogs and online forums as many are registered overseas but use domestic as well as international servers to host their content. The new regulations go further than just the blocking of sites, said Rob Atkinson, president of the Information Technology & Innovation Foundation. The new rules could allow authorities to take the domain name away and not let you have it. And with the requirement to register a domestic domain name, the management of websites becomes more like how authorities in China regulate the media, Atkinson said. 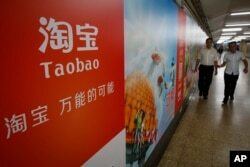 Domain names for many of China’s websites are registered abroad, including Taobao, Baidu, Netease and even state-run broadcaster China Central Television. Some analysts argue that it is unlikely any company will be willing to allow Chinese regulators to block their sites at will. William Long, an IT blogger, said another problem the proposed rules raise is the fact that the main company for registering domain names in China is run by a subsidiary of Alibaba, called Wanwang. Long said it is hard to imagine domestic competitors being willing to register with Wanwang, let alone multinationals. But that is not the only possible outcome, said Ma, the lawyer. He said that while there is a chance that Wanwang could dominate the market, the requirement to register domestically could also help shake up the domain-name market. "Once those companies, which have registered their domain names overseas, return back to China, the monopoly enjoyed by [Alibaba’s] Wanwang may be challenged as they may seek to partner with other providers,” Ma said.